LaConve is an event of comics, anime, entertainment with the most influx and tradition from the north of Mexico. It hosts guests from all over the world and from diverse media like: celebrities, singers, TV & film actors, musicians, mangakas, illustrators, idols, cosplayers and more! Through March 29 to 31th, the 54th edition for this convention will be held in Monterrey, Mexico, at the Cintermex Convention Center. Some of the guests of LaConve 53 were Lou Ferrigno (The incredible Hulk), Brett Dalton (Grant Ward, Agents of Shield), Mark Steger (Demogorgon, Stranger Things), Sam Jones (Flash Gordon), along with more dubbing actors, cosplayers, youtubers, and a lot of illustrators in the artist alley. As we get closer to dates of LaConve 54 in Monterrey Mexico, there’s still many guests left to be announced. 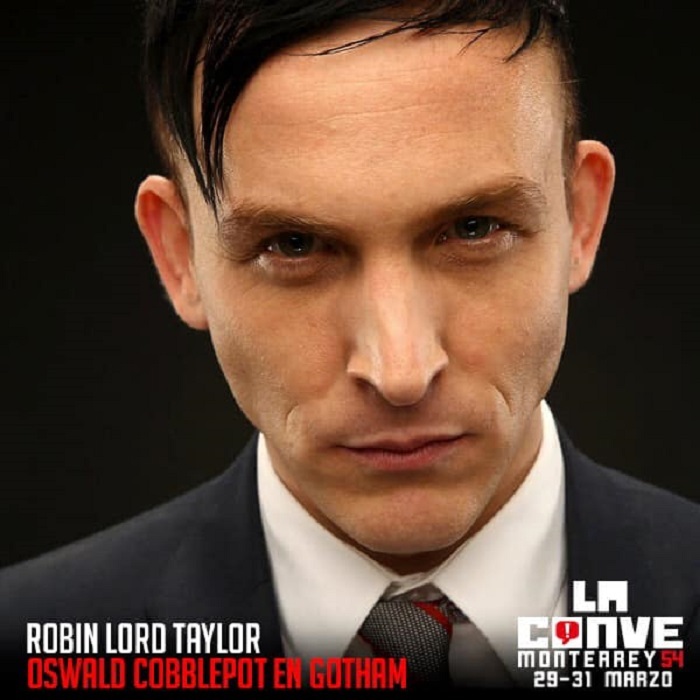 Through next week they’ll announced their third international guest who will join Robin Lord Taylor (Oswald Cobblepot / Penguin in “Gotham”, and Sam in “The Walking Dead”) and Trevor Stines (Jason Blossom in “Riverdale”) in the list. Rocío Garcel: with a career begun in 1959, she has over 5 decades in the industry, voicing Grandma Coco in “Coco”, Grandmother Fa in “Mulan” Bulma in “Dragon Ball, among other characters. Carlos Segundo: voice of Piccoro and Kami-sama in “Dragon Ball Z”, Alf in his homonymous show, Woody on the Toy Story franchise and Severus Snape in several of the Harry Potter films. Cristina Hernández: voice of Sakura in “Sakura carp Captors”, Chibiusa Tsukino and Sailor Chibi moon in “Sailor Moon”. Also dubbed characters from the pokemon and Digimon shows. Edgar Clement: One of the most outstanding graphic storytellers in Mexico. Part of the “Sistema Nacional de Creadores de Arte” (Narional Creators Guild) and currently developing an editorial of fanzines. Carlo Barberi: Worked in books like JLA Jr., Superman, Impulse, Batman Orphans, JLU, Outsiders, Blue Beetle, Flash, Batman Brave and the Bold, Green Lantern and Supersons for DC. For Marvel Comics he had worked in Spiderman, Scarlet Spider, Thunderbolts, Amazing X-men, Amazing Spiderman, and more. Ariel Medel: Comic book professional since 2012, and since 2013 in the USA working for Zenescope in titles like Quest, Masumi, Wonderland and Grim Fairy Tales. He also had worked for Marvel Comics and Dynamite. Omar Saldivar and Hedwin Saldivar: Working for independent comic publishers in the USA such as Zenescope, Kid Comics, Printed in Blood, Titans Comics and more. Winners of “The Lakes International Comic Art Festival Anthology” in 2015. Eva Cabrera: Working for Boom Studios, Black Mask Studio, OniPress and Top Cow. Co-founder of Boudika Comics, a Mexican studio where she publish her stories. Winner of a Will Eisner Award for Best Comic and nominated to a GLAAD Award. Victor Olazaba: Mexican Inker, currently working for Marvel Comics in The Amazing Spiderman. Winner of a Inkwell Award for Favorite Inker. Mauren Mendo. With 21 years of experience, Mendo is the official interpreter of the Opening for “Saint Seiya” (original animation) for the Latin-American version and newly editions of Saint Seiya. Among the announcements, LaConve and Maul Cosplay share that he cancelled his appearance at LaConve due personal reasons. We are less than two months away from this convention and at Mulderville we’re waiting for more news to come. We’re all fans at LaConve!